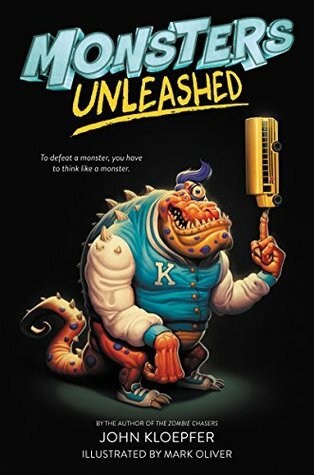 Book Lovers Life: Monsters Unleashed by John Kloepfer Review! There’s just one way to stop these oversize beasts: recruit the bullies, since only they know how the monsters think. But teaming up with his worst enemies is Freddie’s worst nightmare. Can Freddie make friends with his bullies and save his town, or will the monsters have the final ROAR? Freddie's way to deal with the bullies is to draw them as he sees them, as monsters. Freddie and his one and only friend, Manny, want to make a Monster movie, so they decide to 3D print Freddies monster drawings from the art rooms 3D printer. The printer seems to have some weird new ink but it doesn't deter the two boys and they set about printing the 3 drawings. But things take a turn for the worse and the printings come to life, and when they get wet, they grow!! How can they stop these monsters when they have the powers Freddie envisioned they would?? This was such a fun story!! Freddie is awesome. When his monsters come to life, he realises there is only one way to stop them, and that's to go to the people who know them best, the bullies. They are the only ones who know what their weaknesses are and since Freddie made them to be like the bullies, his only hope to stop them is to ask the bullies for help. Freddie is a great role model for kids as he doesn't let the bullies get him down, and he's willing to do what's needed no matter what. The message of the plot was good too. The bullies soon realise that Freddie isn't as dumb as they think and he is actually a pretty descent guy. They also get a taste of what they do and how they look to other people when they come face to face with their monster alter ego!! In all, this was a quick and easy read. My son thoroughly enjoyed the book and he loved the illustrations. I would love to see more from Freddie and Manny! !